In the midst of all of our unpacking and getting our home together – we have Olivia’s second birthday coming up! Of course we are hosting a party for her and I was positive I wanted to have it in our new home, even if we are not completely ready to show it off. It will always be a work in progress! 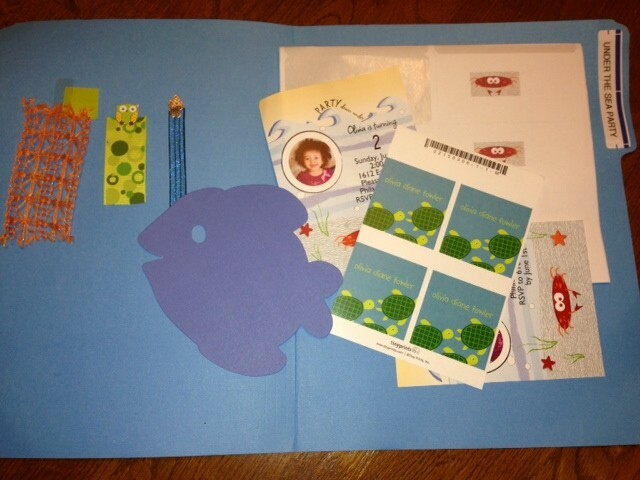 This year we picked the theme “Under the Sea.” Here is my Party Inspiration Folder that I carry around in case I see anything while I am out shopping that might go along with our theme. In it I carry the invitation, some crab labels I made to match the invite, ribbon I bought that I will use for presents and decorations, a piece of blue fish paper, and other swatches and sea like things! Things are starting to come together! Of course I will post all about the party after-the-fact. Click here to see Olivia’s Ladybug Birthday Party last year: Preparing for the Party and Ladybugs for our Little Bug. Check back next week to see party pics, along with all my Under the Sea ideas for the menu, decorations, games, and goodie bags! Have a great day. Thanks for stopping by. Love under the sea theme. That was Lainie’s nursery and her 3rd birthday theme 🙂 I can’t wait to see pictures!